Located in Sullivan County, approximately 5 miles northeast of the Village of Liberty and more than 75 miles from New York City. Formed by the damming of the Neversink River, which continues south and eventually drains into the lower Delaware River. Holds 34.9 billion gallons at full capacity. Placed into service in 1954. 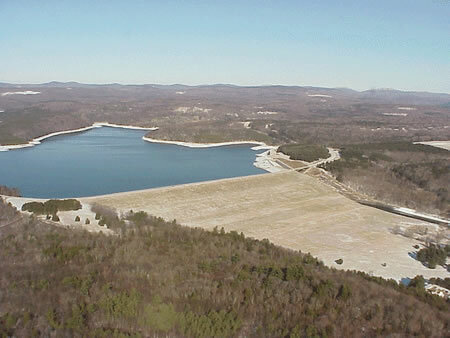 The Neversink is one of four reservoirs in the Delaware Water Supply System, the newest of the City’s three systems. The water withdrawn from the reservoir travels six miles in the Neversink Tunnel to the Rondout Reservoir. There it mixes with water from the other two Delaware system reservoirs, Cannonsville and Pepacton, before heading south via the 85-mile-long Delaware Aqueduct, which tunnels below the Hudson River. Neversink water ordinarily makes its way to the West Branch and Kensico Reservoirs for further settling. At Kensico, it mixes with Catskill system waters before entering the two aqueducts that carry Catskill/Delaware water to the Hillview Reservoir in Yonkers, at the City’s northern boundary, where it enters the water supply distribution system. The Neversink watershed’s drainage basin is 92 square miles and includes portions of six towns: Fallsburg, Liberty and Neversink in Sullivan County, and Denning, Hardenburgh and Shandaken in Ulster County.